For me, there is little better in life than getting away with my family! 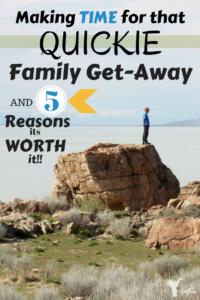 Our favorite go-to vacation is a quick camping trip out on the beautiful dessert with lots of hiking, exploring, relaxing and dirt! My boys are free to roam and discover new things. Many times our small quick trips aren’t planned until the day before, or sometimes the day of. We leave Friday afternoon and return home Saturday night! Not long, but it’s time my mind is free and focused on my boys and my sweet husband. My husband has taught me not only to work hard, but to play hard too. If we have an open weekend we say hasta la vista!! Yes, we have a million things we could stay home and do, but I like to say, “It will still be there when we get back! 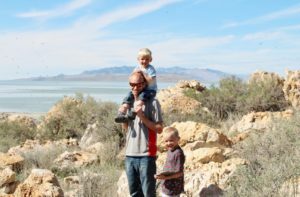 !” Last weekend we went to Antelope island out in the middle of the Great Salt Lake. The day started out a little rough. This was a trip we didn’t know we were making until the morning of. We packed for 2 hours and headed out! This was the work hard part!! HA HA!! Half way through our trip my son came to me and said, “Mom the tub is full of water! It keeps running and I can’t get it to stop!” I go and inspect, and sure enough the tub was half full of water and wouldn’t drain. This only happens when our holding tank in our motor home is full. Our ENTIRE tank of fresh water was now sitting sloshing around in our grey water tank! Even better, my husbands and I’s suitcase, full of clothes, were now in that tub soaking wet! All of my clothes! 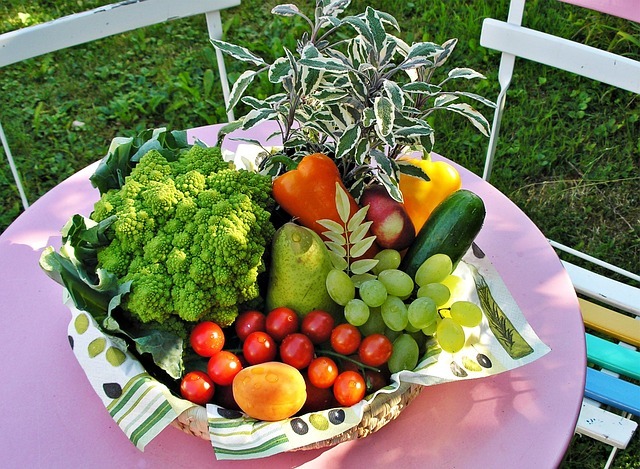 Sigh…..se la vie!! 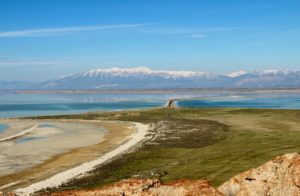 As we were driving on the long stretch of road out to antelope island, we noticed what looked like clouds of dust on the side of the road. We then realized it wasn’t clouds of dust, but swarms of BUGS!! Holy Smokes!! They were so thick. We parked and got out and began the, waving of hands wildly, to get the bugs away. The boys went crazy and began running down to the water, throwing their socks and shoes off as they ran. The closer we got to the water the less flies there were. The water was very shallow and the boys loved playing and skipping rocks. 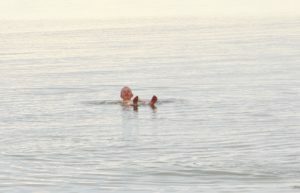 The water was very chilly. As we began our hike back, we began climbing the rocks and immediately begin hearing the low hum of THE BUGS! If you look close at the picture below, you can see the swarms of bugs! Seriously, we were then attacked my millions of flies!! It was hard to breathe for fear of inhaling some! I couldn’t believe it. All of a sudden I heard my husband coughing as he laughs and spurts out, “I think I swallowed one!” (DYING LAUGHING NOW) It was so thick. We found a plaque that told us these flies are Brine Flies and the birds feed off of these bugs as well as keep the water clean. Sheesh!! They also said they don’t bite, or land on humans!! HA HA. #2 My Boys are Free to Run, Jump, Play and get Dirty! We then went out to Buffalo Point and hiked up and out to the point! As we were climbing up, I had a lady start counting all of my boys as they were running ahead of me. 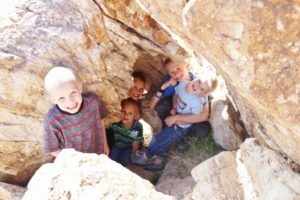 I braced myself for the comments like, “You have your hands full!” or “Are they all yours?” She passed me and smiled and said, “You have a lot of boys to keep up with!” I smiled, agreed and kept climbing. I will admit that deep down, I love these comments! Yes, each one of these comments are mostly true, but I love the challenge my boys give me! They stretch me and make me a better mom everyday! As we scaled the last rocks to get to the top I slowly took in the beautiful view around me! Not only was is beautiful but it was like a giant playground for my boys! Lots of rocks to climb and explore. 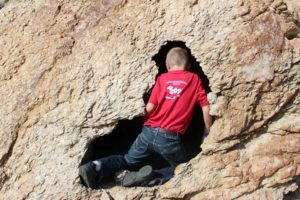 My boys discovered many new caves and paths. They had a fabulous time! #3 – I Was Able to Watch my Boys do Hard Things with a Smile!! On top of Buffalo Point, we spotted a fun bike trail along the coast! We drove down to the trail-head, unloaded our bicycles, and headed out! All of my boys ventured out on this trail from my 10 years old down to my 5 years old. My 2 year old rode with Dad. This was prob my favorite thing we did. I absolutely love watching my boys do hard things. 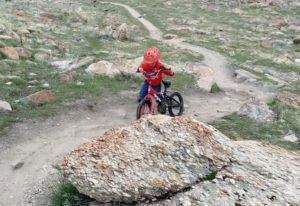 The trail is a little rocky at places but my 5 year old faced them like a champ! He kept saying, “oh yeah!” as he dodged rocks left and right. 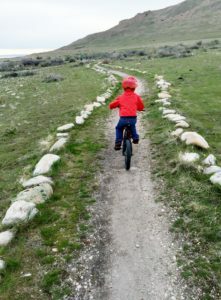 There was a time he had to push his bike up a rocky hill. As he pushed, I heard him say, “I can’t, I can’t!” I quickly encouraged him saying, “We don’t say can’t!! You can do it! !” He then continued to push his bike up the hill and made it. His smile was priceless. Later, on another difficult pass, I heard him muttering to himself, “I will never quit, I will never quit!! !” I loved hearing that! There is a lot we can learn from this little boy!! As we were by the water, we told the boys the water was really salty, and if they went swimming they wouldn’t sink. They looked at us like we were crazy! 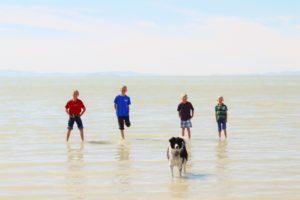 If your interested in the results you can read about how we challenged our boys to get into the water to test if they float and our science experiment HERE, to prevent this post going on forever! 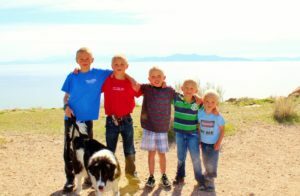 #5 – Lastly, I spent each hour, minute and second cherishing this time with ALL of my boys. When you are home, it’s hard to ignore all of the things that need your attention. Every turn you make there are dishes, laundry, dinner, bills etc surrounding you screaming for that attention. When you leave, your attention gets turned to your family, and that is when the magic and tender mercies happen! Don’t worry! All of those things will still be there when you get home PLUS your kids have a newfound memory locked away for future remembrance! How Much Salt is Needed to Float in Water?